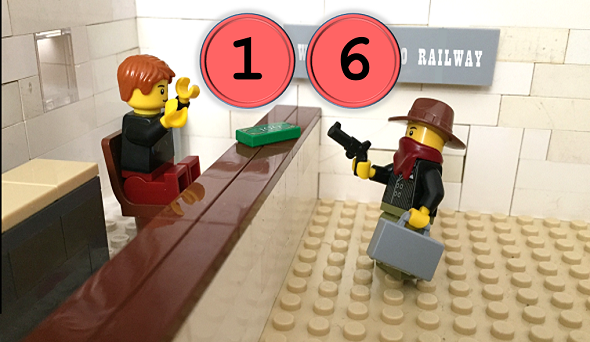 In 1916 an unknown man robbed a ticket counter at the train station of Lima, Ohio. 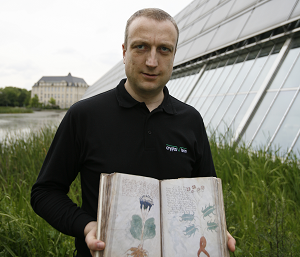 According to a local newspaper he left behind an encrypted message, the purpose of which is unknown. The message has never been deciphered. On June 27, 1916 a man robbed the ticket counter of the Western Ohio Railway in Lima, Ohio. The robber forced a ticket agent at gunpoint to hand him the content of the safe. He escaped with a loot of 265 Dollars. The police department of Lima, O., is greatly puzzled over a cryptic message received in connection with the robbery of a Western Ohio ticket agent. Here it is: WAS NVKVAFT BY AAKAT TXPXSCK UPBK TXPHN OHAY YBTX CPT MXHG WAE SXFP ZAVFZ ACK THERE FIRST TXLK WEEK WAYX ZA WITH THX. This interesting story was discovered by Dave Oranchak (known as one of the crypto experts featured in the recent TV documentary about the Zodiac Killer) and popularized by Nick Pelling on his Ciphermysteries blog. However, it is immediately clear that this solution is wrong. It is extremely unlikely that a monoalphabetic substitution cipher (MASC) produces half a dozen meaningful words (THERE, FIRST, WEEK, ….) within one or two encrypted sentences. Even if one applies the table only to the cryptic-looking words, no readable cleartext appears. It is not known to me what exactly the relationship between the cryptogram and the robbery is. The most likely explanation is that this message is a telegram. Telegraphy was quite popular in 1916, and encrypting a telegram was nothing unusual. Usually, a codebook was used for this purpose. In fact, the train station robbery cryptogram looks exactly like a codebook-encrypted message. The sender left a few less important words (WAS, BY, FIRST, THX, …) in the clear, while he looked up the others in a codebook. If the train station robbery cryptogram really is a telegram it seems possible that the robber sent it immediately before or after the act. Perhaps, the telegraphy clerk informed the police after having realized that he had dealt with a criminal. 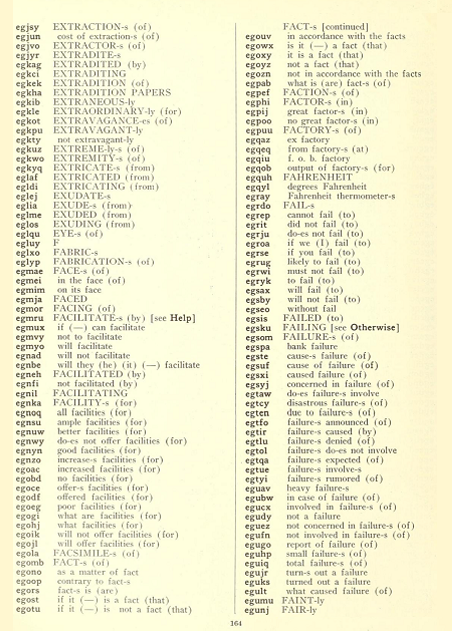 Codebooks were not only used for encryption but also for shortening messages (as you see on the example page above, a codeword like EGEUZ may stand for a longer expression, like “not concerned in failure-s (of)”). For this reason, many codebooks were public and underwent no major changes for many years. If somebody wanted to use a public codebook for encryption, he often applied an additional cipher, for instance by adding the current date to every codeword used or with a similar technique. If the train station robbery cryptogram is actually codebook-encrypted I’m afraid, it can only be solved if somebody finds the codebook that was used. Of course, it is not absolutely granted that the train station robbery cryptogram was encrypted with a codebook. Other encryption techniques used in the time of the First World War are possible, too. In any case, solving this crypto mystery might shed some additional light on a crime, which happened over a century ago. The ciphertext “word” “aakat” pretty much obviates straight substitution anyway. The only words I could find, ooze, eerie, llama, llamas, eerily, oozing, all would not work. Word length guesses. Bound to be wrong (How could we know?) but I haven’t thought of any other initial attempt. was pleased by words relayed from ….. last week Cpt …. TXPXSCK has the same pattern as NVKVAFT. Co-incidence? Tried words ending with “ing”. Cipher probably changes with each letter or wrong suffixes. Autoclave? Discs? Codewords? Maybe “WAS” is not a plaintext word. ?? ?